June 11, 2016. 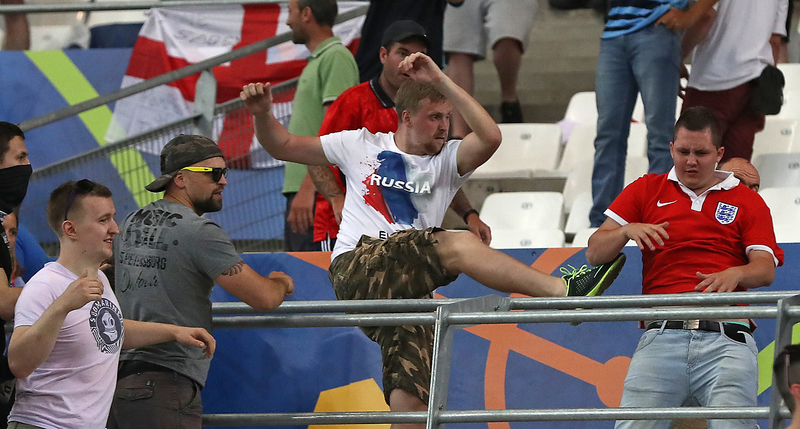 Russian supporters attack an England fan at the end of the Euro 2016 Group B soccer match between England and Russia, at the Velodrome stadium in Marseille, France. A court in France ruled to reduce on Oct. 14 jail terms for two Russian football fans arrested by local law enforcers this summer for taking part in the disturbances during the 2016 UEFA Euro Cup, Alexander Shprygin, the head of the All-Russia Union of Fans, said. "A court in the French province of Provence ruled to ease jail terms for Russian football fans - cutting the sentence by three months for (Sergey) Gorbachev and by six months for (Alexei) Yerunov." Security and fans’ behavior before, during and after football matches has been on the radar of Russia’s football authorities as the country is currently moving into full swing preparations for hosting the FIFA World Cup in 2018. Russian Sports Minister Vitaly Mutko, who is also the president of the Russian Football Union (RFU), urged last month to set up an association uniting all fans’ movements of Russian football clubs. Numerous clashes were reported between football fans at the major European football tournament held in France between June 10 and July 10. The most notorious altercations erupted between Russian and English fans ahead of the June 11th match. Brawls began on June 9 in Marseille, peaking on the day of the match - June 12. Law enforcement authorities resorted to tear gas, smoke pellets and water cannons to disperse the brawlers. According to reports, more than 30 people had been injured in violent altercations, with four people being hospitalized after sustaining severe injuries. On June 14, French cops stopped a bus with over 43 Russian football fans en-route from Marseille to Lille, where their national team played its second group stage match against Slovakia. A court in Marseille ruled in mid-June to sentence three Russian football fans in custody, namely Alexei Yerunov, Sergei Gorbachev and Nikolai Morozov, to prison terms ranging from 12 to 24 months after finding them guilty of taking part in the mass disturbances at the 2016 Euro Cup match between England and Russia.